It's all done with computers. Automatically, 12:01 AM !2/25/2011, the Target ads disappear from television screens and Facebook sidebars, the Jennie Craig ads go up. Next morning, the Lifestyle section of the newspaper switches from appetizer and eggnog recipes to yogurt and exercise programs. After months of selling excess, now it is time to sell restraint. How did it work for you last year? It worked really well for the media. How did it work for you? You can't buy change. And sure as one set of ads replaces another at 12:01 AM, you cannot lose weight by buying a weight loss program. You yourself, not just your body but even your brain has to change. How many times have you heard that the US has the best health care in the world? I won't dwell on that nonsense. But clearly we do not have the best health. Out of 221 nations, the US ranks #50 in life span. That puts us at the 77%, a low C at St. John's Parochial School where I went, maybe a B in public school, grading on the curve. So to speak. Meanwhile, compare Jordan at #29, South Korea at #41 and Bosnia/Herzegovina at #45. Those numbers come from the CIA's World Factbook, where they say Life expectancy at birth is also a measure of overall quality of life in a country and summarizes the mortality at all ages. It can also be thought of as indicating the potential return on investment in human capital. In other words, a low C, B if grading on the curve, is the quality of life you get healthwise if you were born in the US, the country with the best health care in the world. Who came up with that claim, anyway? In a different but related index, the World Health Organization charts BMI, Body/Mass Index, a measure of weight in relation to height. The US ranks #54 out of the 60 nations for which it has data, for percentage of people with normal weight, neither too heavy nor too thin. That puts us at the 10th percentile, an F-, whether grading on the curve or no curve. Only 36% of US citizens have a healthy weight. Meanwhile, back in Prozac Monologues Land, people with severe mental illness beat out the rest of the population in the race to break the scale. Clinical studies have reported rates of obesity in patients with schizophrenia or bipolar disorder of up to 60%. That compares to 34% in the US population, a number that already staggers the imagination as it is. The most common medications for these disorders, lithium and antipsychotics, especially the new ones are notorious for weight gain. It is surmised that the weight gain comes from disrupting both metabolism and the neurotransmitters that regulate appetite. But medication-naive patients also have a higher risk for overweight and obesity. The negative symptoms of schizophrenia and the depression-part of bipolar (lack of interest, inability to feel pleasure) lead to more sedentary lifestyles and more weight gain. From the Damned-If-You-Do-And-Damned-If-You-Don't Department, the medications for schizophrenia and bipolar mostly reduce the positive symptoms (delusions in the case of schizophrenia, high energy in bipolar - the symptoms that scare your families and your care providers who write the prescriptions). They tend to increase the negative symptoms (thereby relieving the anxieties of your families and your care providers who write the prescriptions), providing that synergistic effect that nails you to the sofa. There may be pre-existing genetic connections between what is considered two different conditions, overweight and mental illness. The DSM defines mental illnesses on the basis of certain symptoms. It does not describe what is actually going on inside the body to produce the symptoms. Metabolism, energy levels and regulation of appetite are all controlled by parts of the brain, often with genetic predispositions. While these are included in the symptom lists for mental illness, they are not the defining symptoms targeted by treatment. Add it all up, what do you get? People with severe mental illness die 15-25 years before the US national average. Rwanda beats us. We have the life span of people born in Sudan. What do we die of? No, suicide is not a significant factor in this equation. We die of cardiovascular disorders, metabolic disorders and cancer. Just like everybody else who weighs what we weigh. What Are Our Doctors Doing To Save Our Lives? Our doctors are doing their best to prevent symptoms of our mental disorders, the scary symptoms, hallucinations, delusions, too much energy combined with poor judgment that get us into trouble with the law. They are not doing anything about what is going to kill us. Well, okay, they are psychiatrists; they treat psychiatric disorders. They are not general practitioners nor weight-loss specialists. So here are two more reasons embedded in the US health care system that contribute to our lethal obesity. Notwithstanding that excess weight is a symptom of our disease and also a side effect of treatment, our psychiatrists consider our weight issues to be none of their business. Never mind how significant this unaddressed health issue is when it comes to whether we are even willing to take the meds they prescribe. People who have mental illness are less likely to have health insurance. We are less likely ever to see any doctor other than the one at the community mental health center who is treating our mental illness. Not to mention access to weight loss programs. Not to mention money for fresh foods or exercise programs. The upshot: what are our doctors doing to save our lives? Precious little. Okay, having said that, some doctors are doing more. My doctor listened when I told her my family medical history, that everybody in my family dies of heart disease, that my younger brothers had heart attacks at age 55 and age 29. When I said I would not take Seroquel unless I was psychotic, she paid attention. She tried to find meds that are weight neutral that I could tolerate. But from the things I have written lately about my current psychiatrist, my readers who have real life experience with psychiatrists know that she represents a minority in the profession. What most patients get from most doctors is the pro forma reminder that we won't gain weight if we don't eat more than we expend in energy. So all we have to do is eat less and exercise more. There. Their responsibility has been discharged. Here, as in almost every area of our recovery, we are on our own. Recovery is up to us. We have to lose weight anyway. We have to. It's our hearts, our blood vessels, our pancreases, our knees and hips, our brains, our lives, 15-25 years worth of our lives that are at stake. We will be swimming upstream, up against the forces of whatever is going on in our genes, our dopamine channels, our pineal glands, our medications, our lack of health care, our poverty. So? 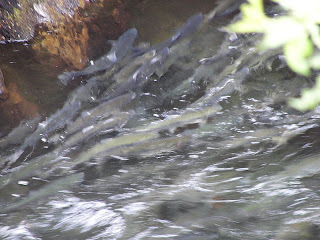 Salmon swim upstream all the time. Salmon are programmed to swim upstream. We have to program ourselves. A New Year's resolution will not change the program. Did it last year? So here comes a series on reprogramming our brains. It is a series, because we have to take it step at a time. Word of encouragement: If you made it to the bottom of this post, you are probably already past the first step. Who knows, maybe this series will carry us past the New Year's/Jennie Craig/NutraSystem et al season and up to the Super Bowl/Bud/Doritos season! You write what I think. Thanks for maintaining this intelligent articulate blog.